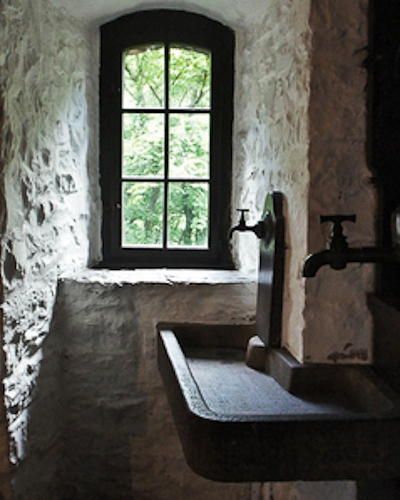 Amazing rustic bathroom renovations do not come from box stores. Truly unique rustic bathrooms will use custom materials such as concrete, reclaimed wood, and stone. These desirable materials have made their way into upscale bathroom renovations in a big way. Decorative concrete countertops alone, or coupled with reclaimed wood flooring and stone sinks, make a big impact on bathroom designs. Reclaimed wood is one of our specialties and with proper sealing this material makes for beautiful features in any bathroom. It is a possibility for flooring as well as countertops and custom vanities and cabinets. Bathroom vanities created in a rustic fashion are wonderful options especially for small bathroom ideas. Without changing the size of the room you can add amazing character with a custom bathroom vanity and possibly gain space with a custom size. Even tiny vanities refitted with stone, concrete, or reclaimed wood tops will bring a custom bathroom look to the room on even a tight budget. New and existing bathroom cabinets can be easily customized to bring in a rustic element. Even inexpensive cabinets can take on a new persona with hardware and door changes. Think open faced doors with rustic shelving, think re-purposed items used as cabinet pulls, and most of all think found antique hinges. Backsplash ideas to produce a rustic feel overwhelmingly incorporate manufactured stone veneer. Reclaimed brick is another upscale option with a wonderful selection to choose from. Mixing either of these materials with reclaimed wood or metals will create dramatic effects. Follow Bill Pearn Masonry's board Rustic Bathrooms on Pinterest.